PREFECT. HOUSE CAPTAIN. Winner of both the Victor Ludorum and a Virtus Award. Model pupil, right? Sebastiano Arlotta Tarino (Belvedere, 2007) says it is not that simple. Instead, Sebastiano, then aged 15, spent a fortnight at a home for retired priests near Bern. He realises now that the Head Master at the time, the Reverend Jonathan Long, and his Houseparents, the O’Connors, still believed in him. “If it wasn’t for the patience, passion and trust of the people around me, I might never have broken out of the vicious circle I was in,” he says. Nowadays, he has found another way to harness his energy – running desert marathons. 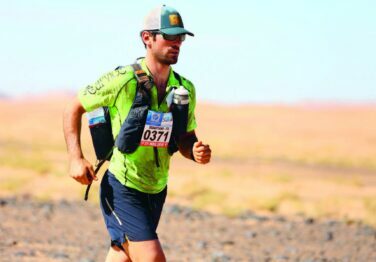 In the elite top 50 finishers of the famously harsh Marathon des Sables two years ago, he was placed sixth in the 260km Atacama Crossing in 2015, and second in the Gobi March in 2014. For his next challenge, attempting to run the 900km length of the Pyrenees in just 10 days, Sebastiano has turned back to Aiglon for help: his former Houseparent, Bill O’Connor, a renowned mountain guide, will be there cheering him on. Just as he did when Sebastiano was that incorrigible young schoolboy.